Murano is the island about a mile from Venice which has specialized in glassblowing since 1291! 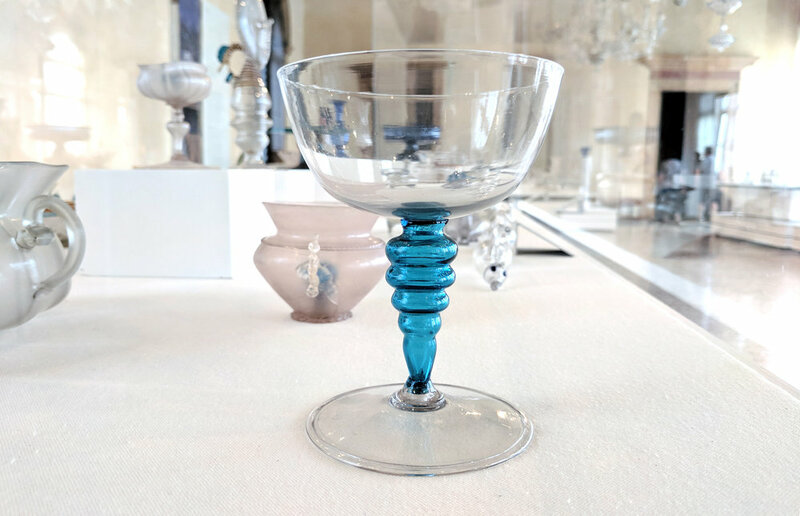 As glass became more popular, the city's leaders ordered glass makers to move their furnaces to Murano to isolate them from the population in case of fire. Murano is probably the most famous place in the world for handmade glass and I was lucky enough to visit for the first time in August, 2017. It was very inspiring to see so many different approaches, learn more about how glass is made, and see some historical work up close. We love to expand on ideas from history for contemporary designs, so I thought I would share some of my favorite pieces and techniques, especially the ones that could inspire future work here in California! 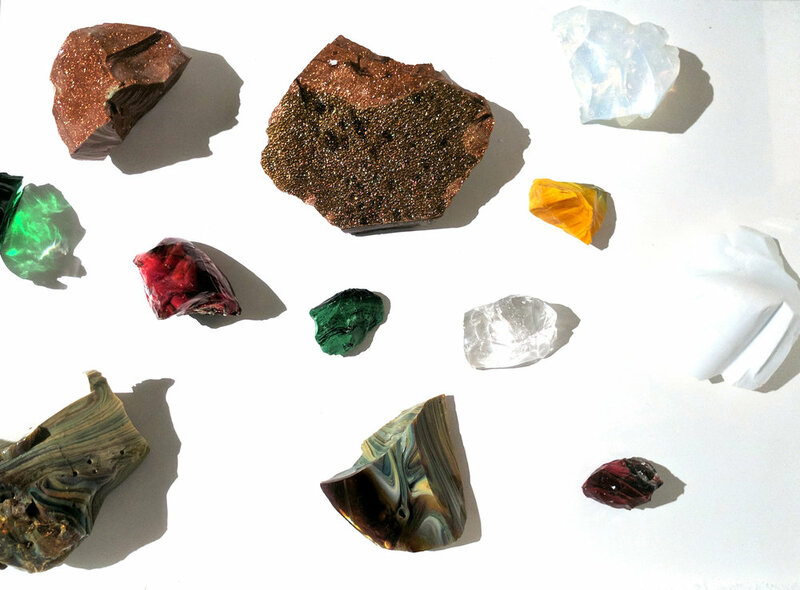 Silica (top left), soda or Limestone, and potash (potassium oxide). 3 raw Ingredients used to make glass. Silica (a very pure form of sand) is the main material, soda stabilizes the glass and makes it waterproof, and potash lowers the mixture's melting point. Glassblowing furnaces are normally around 2300°F. Various metal oxides (left) are dissolved into the glass to change it's color. The cobalt blue on the bottom right is actually made with cobalt oxide! Ceramic pots called crucibles are used to hold the the molten glass mixture. The crucibles on the right have been cooled down and cut in half. Lots of different kinds of colored glass! Marbled "Chalcedony" was made by mixing leftover colors with white, opal, and crystal glass. The Chalcedony technique began in the Roman age but first appeared in Murano during the Renaissance. These examples are by Lorenzo Radi from the 19th century. Goblets! Murano is famous for their delicate and ornamental goblet-making techniques. A goblet of this style made by a glass Maestro today can cost somewhere around $1000. Some contemporary glassware by Carlo Moretti studio. 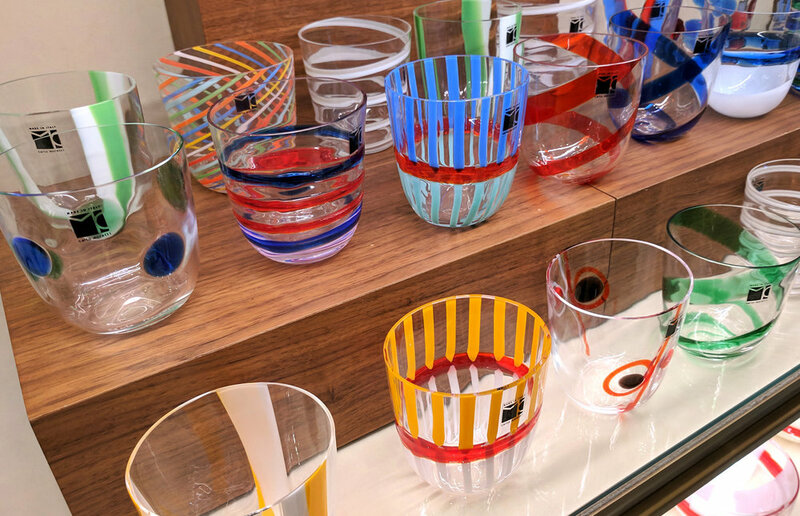 Classic pieces from Venini, a Murano glass studio that makes it's pieces in collaboration with designers! 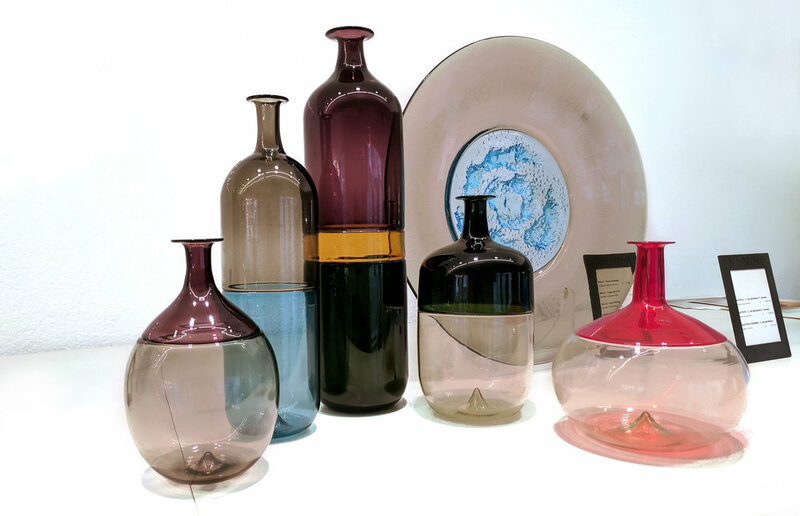 The collection of bottles (Bolle, 1966) and the plate (Piatto Di Tapio, 1970) are by Finnish designer Tapio Wirkkala using the incalmo technique. Incalmo fuses multiple bubbles of different colors together, each open on one side, to create hard separations between sections. It is extremely difficult because the open edges of both bubbles have to be exactly the same diameter and stuck together while they are hot enough to move around. We are huge fans of Tapio!